This seminar-style course provides a map to and grounding in the intellectual and institutional traditions that have contributed to the still-emergent field known as material culture study. Thus, "material culture in its contexts" refers not only to a field of study, but also to the multiple approaches through which items of material culture have been interpreted in their cultural-historical settings. 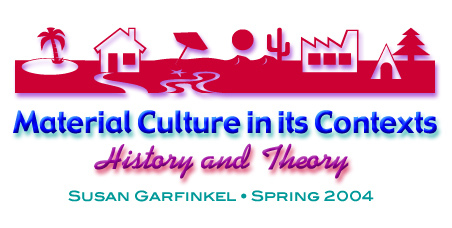 Designed in two parts, this course will provide a survey of the field's historical roots before moving on to examine and evaluate the variety of contemporary approaches to material culture scholarship. Students will be asked to consider such basic issues as what works and what doesn't; how institutional, political, disciplinary, or scholarly agendas may affect approaches to interpretation; and how theories, practices, and communities ground our own relationships to the field of material culture study in the present. Course assignments will include: ongoing active participation (10% of grade), short weekly written responses to readings (15% of grade), a book and an exhibit review (15% of grade each), and a research-based analytic essay with associated oral presentation (45%).